One of our favorites in the mixed border, these fragrant and versatile beauties willliven up any perennial garden. Geraniums are frequently used by garden designers, but have somehow been overlooked by most homeowners planting their own gardens. Their dense mounds of lush foliage start early and last long after other foliage has faded. 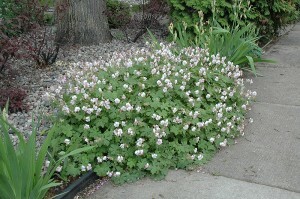 White, pink or purple flowers bloom abundantly in May and June. Some varieties even bloom into October! Foliage is evergreen in some species giving them year-round interest. 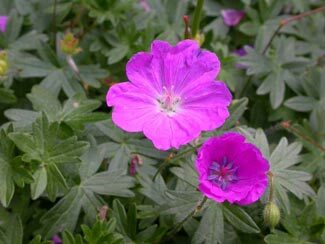 With a wide range of species and cultivars, there is a geranium that will thrive in almost any northern garden. 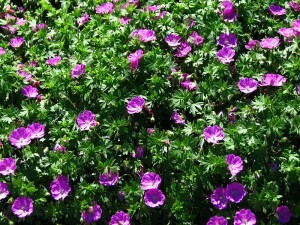 Will the real Geranium Please Stand Up? When most of us hear the word “geranium”, we think of the bright red flowers of the annual “geraniums” we saw as potted plants at our grandmother’s house. This ubiquitous house plant is actually a pelargonium, a cousin of the true perennial geraniums we’ll introduce you to here.Perennial geraniums (actual members of the genus Geranium) are quite different plants. We’re going to introduce you to a group of lovely, versatile, and fragrant garden perennials that are a must-have for any mixed border garden. 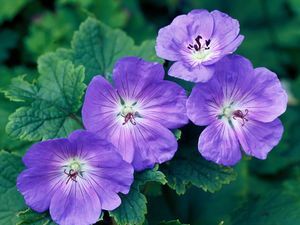 The genus Geranium includes over 400 species (sometimes called “Cranesbill”) and endless cultivated varieties.We’ll introduce you to the few cultivars that will really perform in your garden.Most geraniums are low growing, mounding plants that are at home in the front of the border.Some are semi-evergreen and most have foliage that has a unique spicy scent.Flowers range from white to pinks and purples. So, why do we love geraniums so much?Here’s a short list of what makes them so valuable:1) Fragrant foliage that looks good all season long, 2) Blooms that are numerous, long lasting and reliable, 3) They grow vigorously in a wide variety of conditions and 4) Deer don’t like them!This is a list not many perennials can duplicate.Geraniums even look great in mass plantings or by themselves mixed with complimenting perennials. While these little beauties are easy to care for and almost fool proof in the garden, there are a few things to watch out for.Geraniums have been so cultivated in recent years, there are some underachieving cultivars on the market.It seems the market has drifted towards creating more interesting flowers and has sacrificed habit and foliage along the way.The major problem with some of the “popular” cultivars is that they tend to either get too tall, and collapse or, they develop a lanky creeping habit that needs frequent trimming.We’ll guide you to the tried and true varieties that really work starting with some of our very favorites. 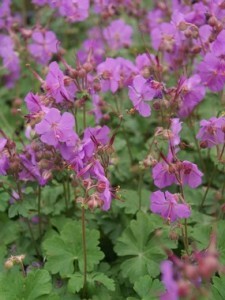 Geranium sanguineum “New HampshirePurple” – This is an old standard among the perennial geraniums. It’s become a little hard to find these days due to the onslaught of new cultivars flooding the market, but it’s worth the effort to find it. 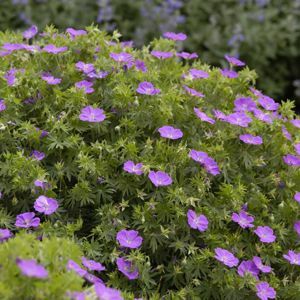 “New Hampshire Purple” is one of our all-time favorite perennials.This geranium quickly creates mounds of deep cut foliage 12-18 inches high and is covered in magenta flowers from late May to late June. It even flowers sporadically after that, until frost.’New Hampshire Purple” prefers sun, but it can also take some shade.It will clump generously, so it is very easy to divide and spread around the garden (but don’t worry, it’s never invasive).New clumps grow quickly into flowering mounds.The only drawback to “New Hampshire Purple” is that it sometimes gets a little too tall and will collapse a bit in a good rain.If this happens, don’t worry, you can just wait a few days for it to recover or you can give it a trim and within a week it will be flushing out new growth. produces virtually the same magenta flowers, but it grows much more slowly and stays a compact 6-12 inches.This means that you never have to worry about it collapsing in the rain, but you will also need to be more patient if you want to divide it and spread it around the garden.If filling in large areas is your goal, then stick with “New Hampshire Purple”.If you want a more tidy, compact plant that never looks messy, then go with “Max Frei”. but it can stand on its own as a perennial in a mixed border.It also looks great in mass plantings in the shade.It has a compact habit of lush, semi-evergreen foliage that has a strong spicy fragrance.Rose pink flowers are borne on stems that rise slightly above the mounding foliage for an elegant effect.Bloom time is late May to early June.The bloom period is much shorter than the Geranium sanguineum varieties, but the beautiful foliage more than makes up for its short bloom time.You never have to worry about “Bevan’s Variety” looking messy or unkempt.It always looks tidy and lush, even after the first few frosts. It also divides very easily and grows quickly. For shady spots, this is the geranium we suggest. tighter, forming very dense, fragrant green mounds of about 6 to 8 inches. “Biokovo” has white flowers, while “Karmina” has rose pink flowers.Otherwise, they are virtually identical. Bloom time is long, from late May to late June. 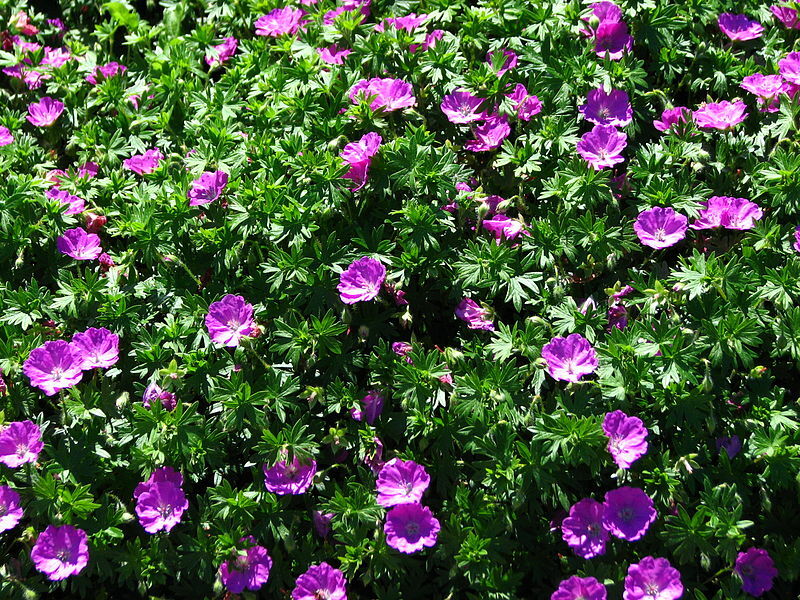 “Biokovo” and “Karmina” can grow in both full sun and part shade and perform equally well.Like most geraniums, they divide very easily and grow quickly.They look great on rock walls or in mass plantings. 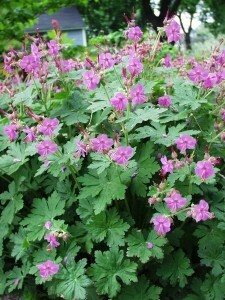 Note : We have found the cultivar Geranium X cantabrigiense “St. Ola” to be virtually identical to “Biokovo”, so you can use them interchangeably. Geranium X “Rozanne” – This is geranium is undoubtedly the most popular in recent years.Its fame is due to its unusually long and prolific bloom period.“Rozanne” produces a profusion of purple flowers with white centers from late May to mid October.It’s truly a marvel among its peers.However, it does have a few serious drawbacks.It grows extremely fast and can become long and leggy almost approaching the behavior of a vine.It’s also rumored to have a relatively short life of just a few years.It does best in full sun, but flowers almost anywhere.If you want lots and lots of flowers, then “Rozanne” may be for you.Just be prepared to either enjoy the messy, leggy habit or trim it regularly to keep it in check. You will find many, many more varieties of perennial geraniums on the market, but these few will fill almost any garden need and will be reliable and relatively easy to find.Many newer varieties will have more interesting flowers, but may not be as vigorous.Try geraniums in mass plantings, or on the edges of stone walls.They look great almost anywhere.And, more importantly, they look great all season long.Not many perennials bloom in May and still look good for the rest of the season.They are a must for every garden with deer problems.Geraniums are among the few perennials I have never seen a deer eat! So, go ahead and try out one (or more!) 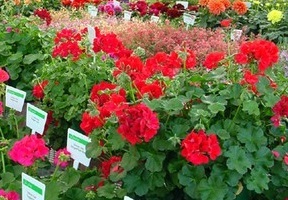 of these geranium varieties in your garden.You won’t be disappointed! 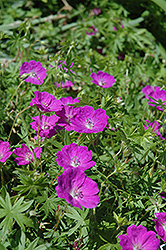 This entry was posted in Gardening, Perennials and tagged bevan's variety, cranesbill, geranium, geranium cantabrigiense, geranium macrorrhizum, geranium sanguineum, max frei, new hampshire purple, perennial geranium, rozanne. Bookmark the permalink.